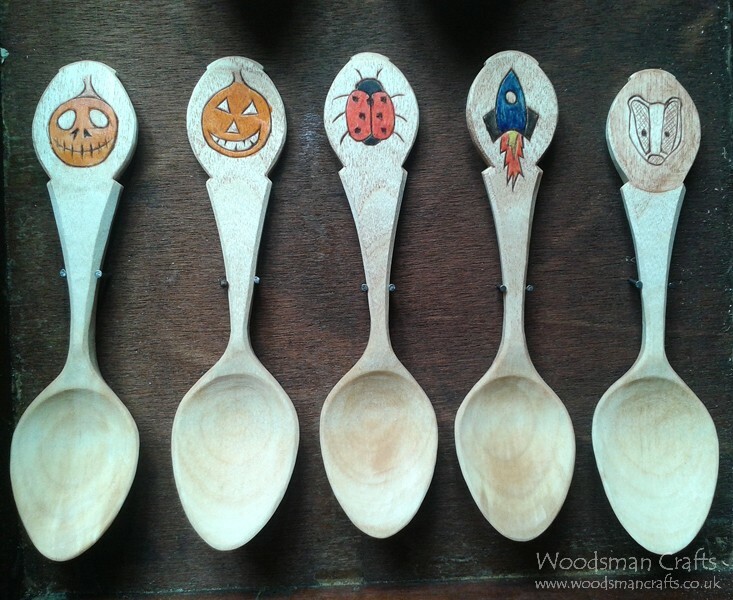 Now available in the Web Shop, four new designs for kids and grown ups if you fancy a slightly smaller eating spoon. All chip carved with the tip of my Frosts Mora 106 carving knife, and painted with non-toxic Oil Paints. I've been having a nice break from spoon carving lately and in fact a lot of craft. There's been a run of Barkcraft teaching latley which has been fun and a couple of shows I've demonstrated at, but apart from those events its been mainly walking about in this gorgeous autumn season trying out wild food recipes and taking in the colours and smells. 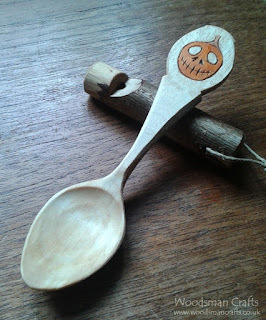 After one of the shows I had several spoons half finished, so I finally got round to some carving to try and catch them before going too dry. 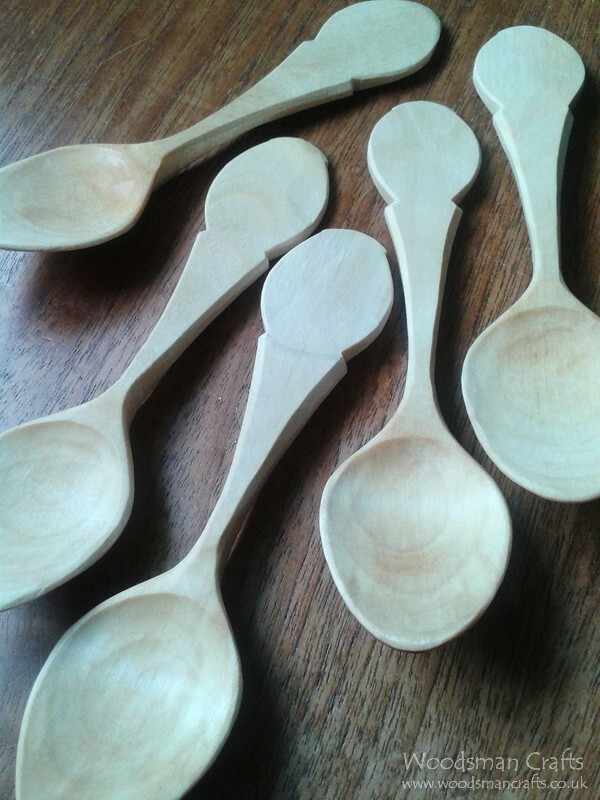 These are the small eating spoons I make, which are 1/3 smaller than the standard size. Great for smaller containers like individual yogurt pots and tins of fish, or smaller hands and mouths. 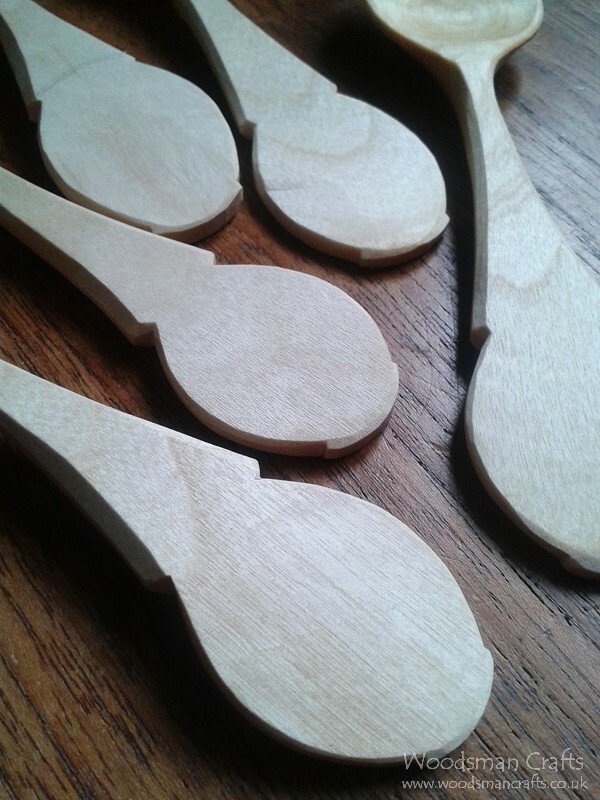 I'll be decorating these with simple childrens designs using paints and chip carving. Keep an eye out in the webshop in the coming days. Well, its been a while. 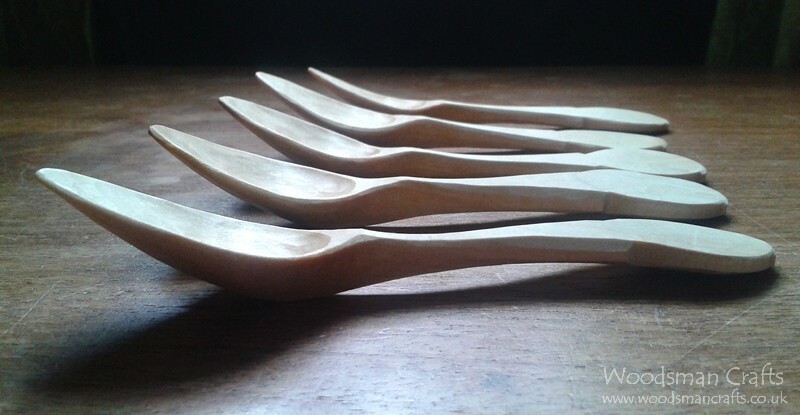 Being busy with spoon making, teaching and studying natural history hasn't left much spare time for anything else, but sometimes you just get the urge to stay up late and make stuff. Firstly, I was gifted an old British "Stubbs" metal working file that was perfect for a bushcraft knife. Nice to make a blade from scratch using old steel, and to handle it I chose a section of reindeer antler for the bolster, and sections of pewter and leather to frame a section of English Yew. To finish, a lovely section of Birch Burr. Western style sheath with welted seam. Next up, a Frosts 106 woodcarving blade handled in Brass, leather, birch bark and a very nice section of English oak. I'm very pleased with it, and the handle shape is based on the handles of a fellow knifemaking buddy, Scruff. He has handled many blades and I think the Bird and Trout blades (made by Bernie Garland) he handled back in 2010/11, are some of the best out there. Very comfy to use, simple, look elegant and flow so well. 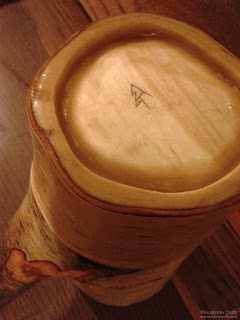 Can you really believe such beautiful things hide in wood. I decided to make a traditional Scandi Sheath for this one with a wooden insert. All the wood as ever is saved from tree surgery work that I have completed in the past. Its great to finally reveal the beauty of wood after so long. Finally adding the linseed oil after lots of hard work, is always exciting. Instagram has been a quick and easy way to pop up things I've been doing. Its good fun, but obviously limited compared to writing a blog article. 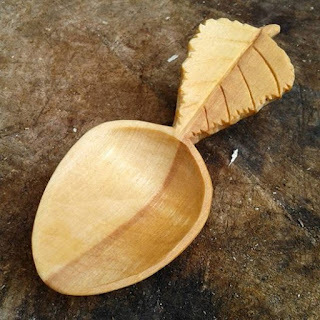 I try to use a few different platforms for my work, so thought I'd have a bit of a competition to win a Birch Leaf Scoop, the last of the Two Tone ones that I made from the last batch, via my Instagram feed. Simply follow me, tag a couple of friends, and repost if able, to have a chance to win. Give-away ends 13:30 (GMT) Thursday 24th March, and I'll randomly draw a winner the same day after going through the entries. If you don't win, fear not! I'll be making some more and adding them to the Web Shop soon. Net making is something I don't get to practice much, so as the sun was out I thought I'd head to my favorite wood and make a start on one. First off, get a fire and a brew on. Feathersticks and a flame this time as I was in a rush and everything was soaked. 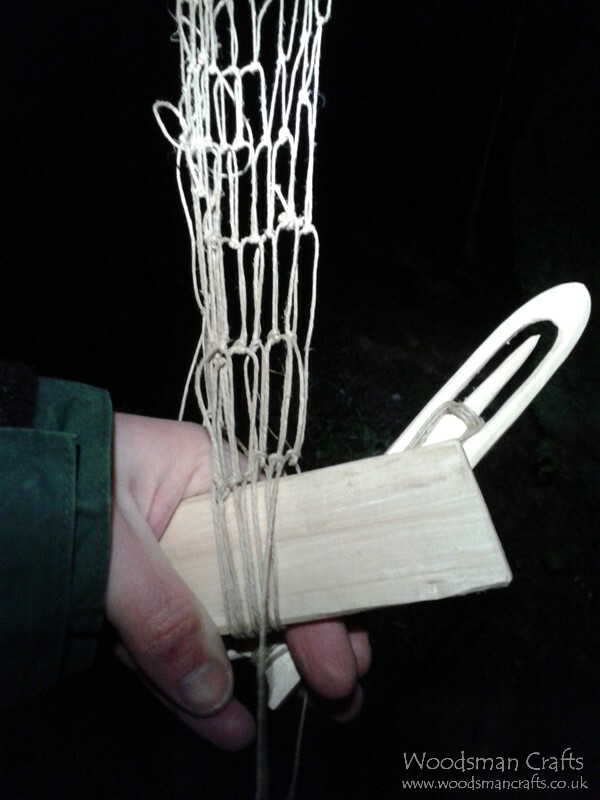 With things looking a little more cosy I went over to the Hazel trees and found a good round section of straight green timber suitable for carving a netting needle, gauge, and making a baton for the splitting. Then onto making the kit needed for the job. 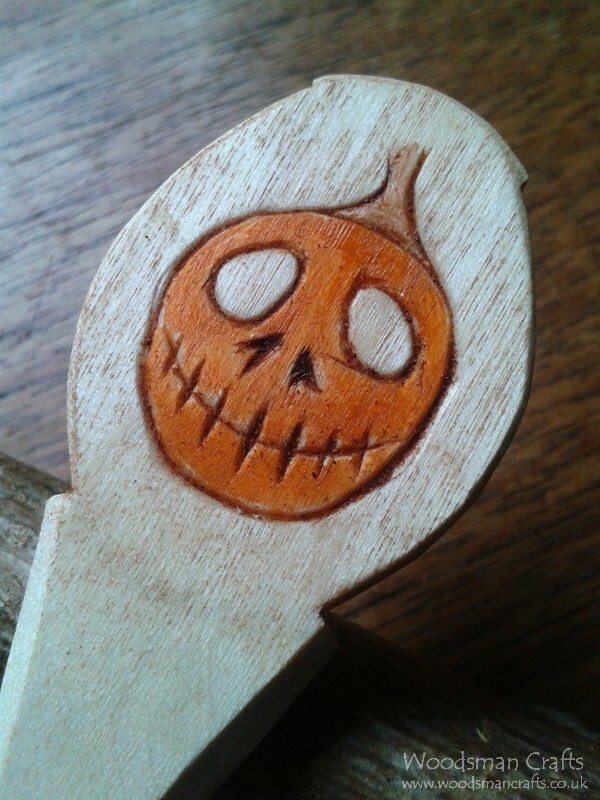 I bought some linen thread along and set to carving the needle and gauge. I wont go into the detail too much as its all been done by many folks before. Check out purse net making videos on you tube, and written guides such as on Jonathon Ridgeons bushcraft site. 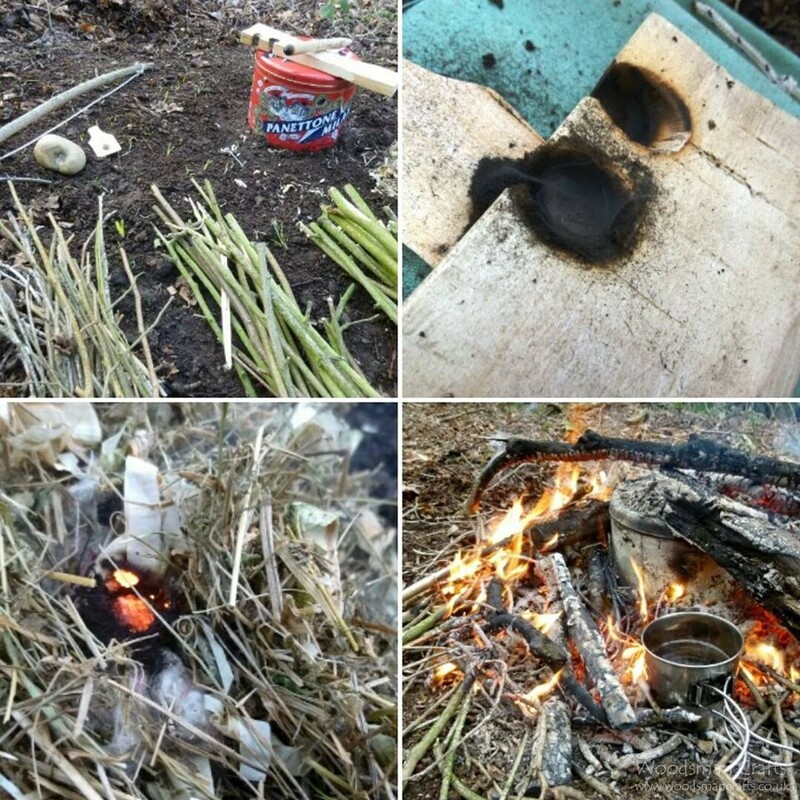 Once the needle was made, a quick cup of tea, and load up some cordage ready to get going. Time was nearly up and Hurricane Gertrude or what ever daft name it was called was getting a good blow on, so I practiced the sheet bent knot and made a series of loops called a chain. Then to continue the trend of tying knots in the wind (often as tricky as other tea related activities ;)) I finished off a smallish net of around one meter square last night. Its quite an enjoyable repetitive job once you get the hang of it. 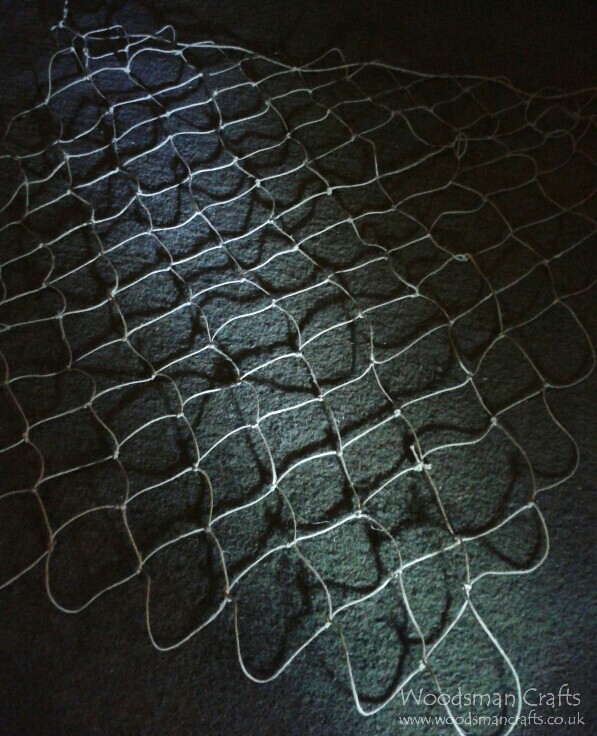 I think this net will be fine for covering a rabbit hole, or as part of demonstrating a spring live capture trap. 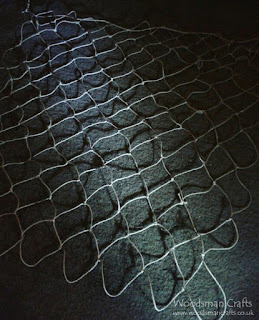 Next time I'll make a larger net with the smallest gauge I can for a primitive fishing lesson aid. I try to get out to practice skills in the woods as much as possible, and winter is often the best time. Its quiet, and there's less pressure on time needed for teaching or preparing for the courses I run. Its also a greater test as the weather can make things difficult both physically and mentally. Looking out that window just before setting off knowing there's going to be a storm coming in or a big sudden difference in temperature can sway your mind. But know its play time, and all will be well. Its also a very good excuse to light a fire so this time I thought I'd bring a bowdrill set along, gather all the firewood and make up a batch of Birch Tar. I managed to score this large Panettone tin to load up the birch bark. I have quite a lot of Birch bark at the moment that I've been saving for my barkcraft sessions. There is always left overs and unusable bits, so they all got tightly stuffed into the big tin. If you've not seen this done before, you punch a hole in the base of the tin and push on the lid when full of bark. Then bury a smaller tin most of the way into the ground as pictured and place the bigger tin on to it, carefully locating the punched hole over its centre. The two tins should make good contact. To help with this and to reduce air to the gap between them, add a little earth around the join of the two and overlap the base of the big tin. Then light a fire around the big tin. 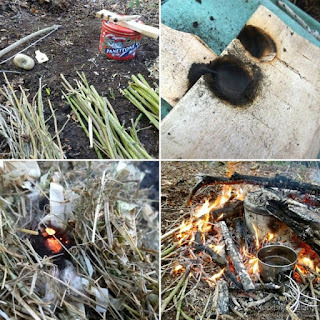 I started small with just an ember from the bowdrill (warms you up on a cold day) into my tinder bundle of dry bracken, grass and thistle heads. 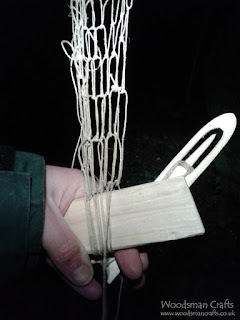 Then add on your kindling - match thick, pencil thick upto finger/thumb thick. At this stage I keep adding finger thick material to create a lot of heat which you need to extract the oil held within the bark and encourage it to run into the lower container. Once I get a good fire going all around the tin I keep it going for around an hour. Now is time grab a cup of tea and relax and just add on fuel as needed. Let the fire die down and the tins cool, this can take a couple of hours and its worth waiting for to get all the last drops of oil out. Then use as required. It can be used as a natural medicine for skin complaints, a water proofing for cordage and leather, a glue when reduced down by simmering, and a decorative finish and preservative for wood. Useful stuff, and it smells nice too. 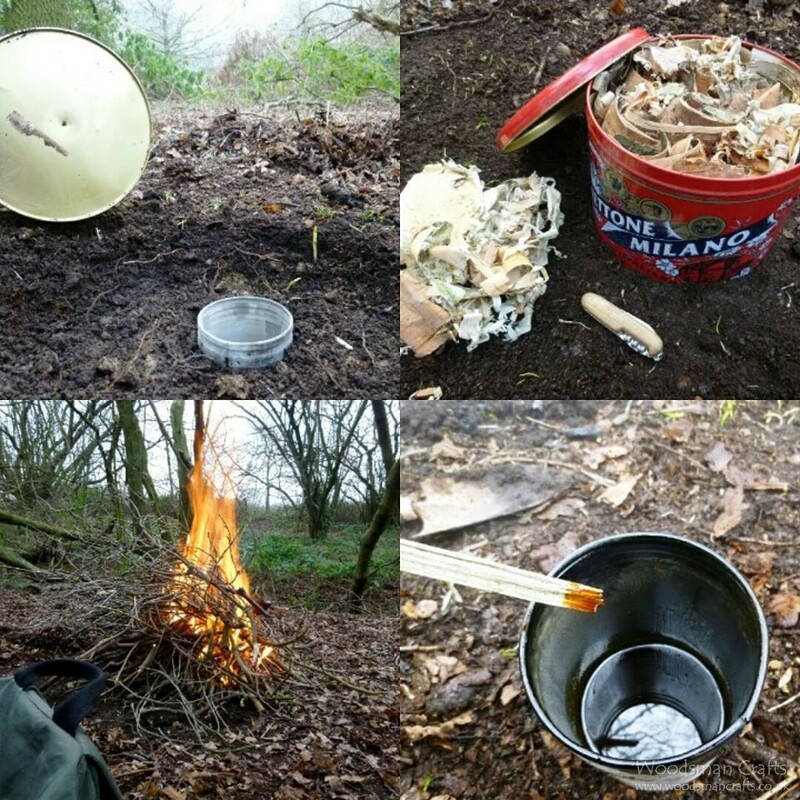 Originally inspired by The Belarus/Partisans episode of Extreme Survival by Ray Mears. Most of my spare time when not carving items for the shop or nipping out to the woods, has lately been spent on refining kuksa shapes, working out the problems with using straight grained wood, and trying out a few new things I’ve not seen done before. I’m seriously thinking of writing an e-book on the subject as lots of people ask me the same questions all the time regarding splitting on drying or when adding hot fluids. Another problem with kuksas is that as much as I love them, even large ones tend to be on the small side when it comes to a big cup of tea or a pint of ale. Fine if you have a tea pot, but still a faff adding milk and sugar again like being in a tea party. So I started to think about shrink pots and making them water tight, then adding a handle for better function and to add some interest. But how to do this? 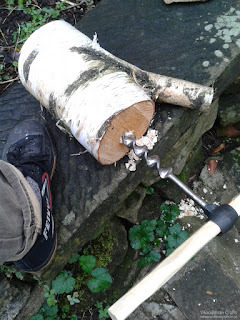 Well, luckily I got the chance to slip on the rope and harness and do some tree climbing and dismantling operations just before Christmas with some Birch - Betula pendula Trees near a chap’s house. They were full of interesting sections for making things from so I started to cut them out with the saw and put them to one side for projects. I started with a large 2 pint shrink pot, complete with a side handle for starters and it was a success. I thought the knots and branch unions would be too difficult to work through but it wasn’t too bad, perhaps because it was so green. It was on the large side though so next up, came a one pint shrink pot this time with the outer bark on and a side branch again. This worked a treat too and is now my standard drinking vessel for ales. Its holding up really well after plenty of use. 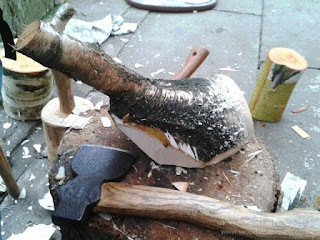 But I couldn’t leave the kuksas behind now could I, so I tried the side branch idea again, mainly so that I could achieve an upswept handle without requiring a large diameter log that then needed a lot wasting away. I made two in quick succession. Both successfully hold hot drinks, so one flew the nest and now lives in Spain, and the other, well I’m keeping it as its one of the nicest things I think I’ve made during all the crafting I’ve done over the years. I hope this gives you some inspiration to think a little out of the box, and not to always do things by the book. The knots all held and as long as you are used to gouge work, not too much bother to work with, and so far all is well with the items apart from a recent fixable split in the 2 pinter due to a hot room and too tight a base. I’m still learning all the time though and it keeps you humble and searching for answers, which is the way it should be.